Hypothesis: I think that the lemon is going to be the highest voltage. I think that it is going to be the highest because lemons contain a lot go citrus and acid and I just have a feeling it will work the best. 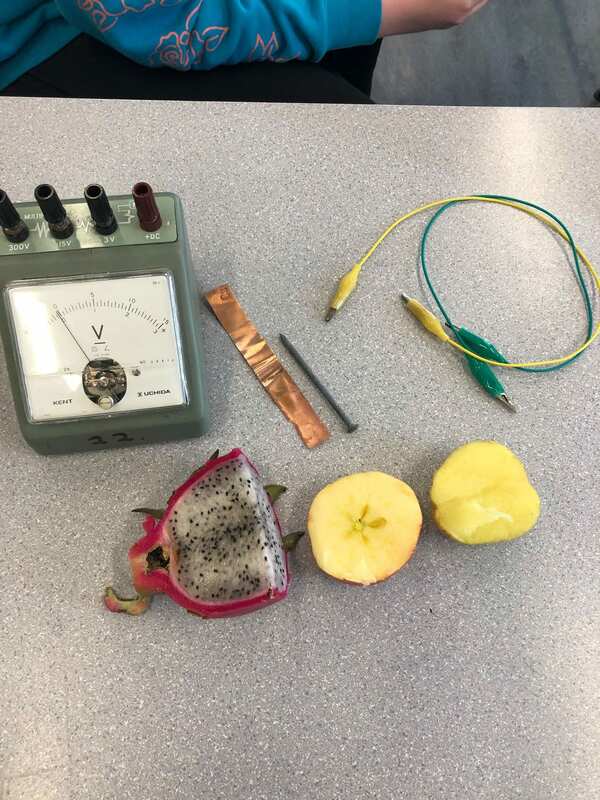 Results: Potato 0.3 volts, Dragon fruit 0.7 volts, apple 0.2 volts, orange 0.4 volts, banana 0.5 volts, lemon 0.8 volts, lime 0.3 volts. The drier the fruits, the less voltage they scored. (the potato and the apple had a lot less than the lemon, lime and dragon fruit). The rods that were stuck into the fruit would tend to fall out and be looser, but once secured the voltage would go up. The size of the fruit didn’t really matter that much, it depended on how much juice is contained or if it was a drier fruit. What kind of circuit will produce electron flow in your fruit/vegetable cell? If your bulb doesn’t glow, how can you find out if electrons are flowing? You could check and see how much voltage it contains and if it is creating charge or not. If your bulb doesn’t glow, why not? It may be because there is not enough voltage and electrons aren’t moving enough to create a charge to power the bulb. Also, check to see if you have a complete/closed circuit to create power. How can we modify our experiment to improve our results? 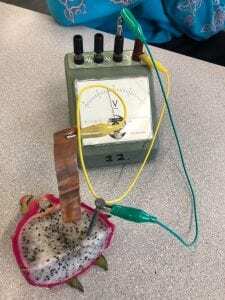 What is causing electrons to flow in this experiment? The acid in the fruit helped the electrons flow. How can I use this in my everyday life? I can use this if I never needed electricity where there was no way to get it. For example if the power is out and for some reason my family and I needed electricity we could use something that uses/provides power to create some charge. In conclusion, my hypothesis was correct. The lemon was had the highest voltage of 0.8 volts. The lemon had the highest of 0.8, and the dragon fruit was not far behind with 0.7 volts. I had a feeling the lemon was going to create the highest voltage because it contains a lot of acid and citrus and I thought it would work best for creating a charge. 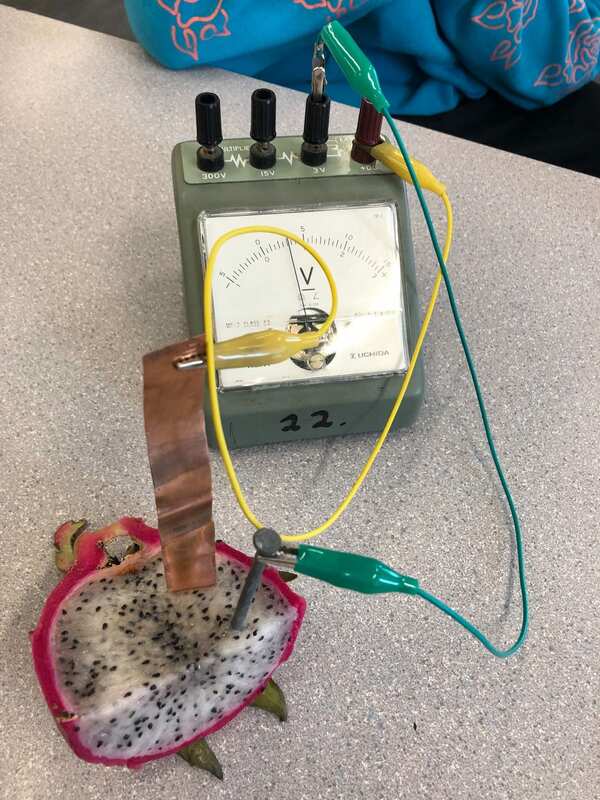 It created a high charge because of the fruit itself and when the metal is co-working with the fruit it creates electrons to move to create a charge. Great work testing so many fruits and putting your results into a great lab format. What is it about the fruit that makes this work? Also, what other metals do you think could make this work even better?